NFL admits that a penalty should have been called on the Chargers for illegal formation on Chiefs’ game winning FG attempt. New rule mandates no more than six defenders on either side of the ball. The best the Chargers could hope to finish was 9-7, and with both Baltimore and Miami (who the Chargers lost to in week 11) ahead of them in the playoff standings, and with both teams coming off of impressive week 15 wins—Baltimore against Detroit, and Miami against Tom Brady (is there any other player on the Patriots 2013 roster that really matters? )—their chances at extending their season beyond week 17 were slim to none. In order to make the playoffs, the Chargers not only had to win their final two games against Oakland and Kansas City, but they had to hope against hope that both the Ravens and the Dolphins dropped their final two games. Even if the Ravens lost to both New England and Cincinnati—both very good teams—there was little chance that the Dolphins would succumb to both Buffalo and the New York Jets—two not so very good teams. And even after the Dolphins lost 19-0 in Buffalo, you had to figure that they’d regroup against a pretty hapless Jets team at home to secure their playoff future, right? But the football gods were smiling on the Chargers. Having both lost the week before, first the Ravens fell to Cincinnati (not all that surprising). All eyes turned toward Miami, where the Jets pulled off the upset (completely and totally SHOCKING!). Against all odds, everything was going the Chargers’ way. All they had to do now was beat a Kansas City team they had already beaten in Arrowhead Stadium five weeks prior, and who, having already secured the 5th seed in the AFC playoffs, was sitting 20 of their 22 starters, employing a backup QB who had never started an NFL game. Win and they’re IN! Piece of cake! And then kickoff happened. And the Chiefs marched 80 yards in five plays to take a 7-0 lead on their opening drive. As well as the Bolts’ defense had played since the Cincinnati debacle, they reverted back to their early season ways where they would have struggled to keep Mission Hills High School out of the end zone. Offensively they weren’t a whole lot better. The offensive line struggled to protect their QB, and the unit as a whole sputtered despite the valiant effort of a hobbled Ryan Mathews—who was clearly not himself even while tallying 144 yards on 24 carries. With the sixth and final playoff spot offered up on a golden platter, the Chargers were treating it like an infectious disease. What happened to the team that rolled Peyton Manning and the Broncos? What happened to the team that manhandled Eli Manning and the Giants, and then the hated Oakland Raiders? But again, the football gods were smiling on the Chargers: When Ryan Succop pushed the game winning 41 yard field goal as the fourth quarter clock ticked down to four seconds wide right; when the officials missed an illegal formation by the Chargers that would have given Succop a second chance at sealing the game from 36 yards, sending the Pittsburgh Steelers, and not the Chargers, to the playoffs. And yet again when, in overtime, the officiating crew blew Eric Weddle’s forward progress dead on a fake punt, awarding a fresh set of downs and negating a fumble and return for a Chiefs game winning touchdown. Mathews and Philip Rivers proceeded to move the team into position for a Nick Novak 36 yard field goal to take the lead, and the defense bowed, holding the Chiefs just out of range for Succop to attempt to tie it up, forcing a fourth down illegal forward pass by Chase Daniel to seal the win and a playoff berth for the Bolts. Any honest observer would have to admit that the Chargers don’t deserve to be playoff bound after such a subpar effort against the Kansas City JV squad. Then again, the Chiefs’ JV effort shouldn’t be all that surprising. There is precedent: In the 2004 finale, with the roles reversed and the Chargers sitting all of their stars having already secured the division title and the fourth seed in the playoffs, the Bolts’ backups took care of business against the Chiefs 24-17, a result few expected; an exhilarating effort that ranked among the most satisfying of a magical turnaround season. The Chargers should have expected this kind of game from a group of reserves looking to prove a point. But they’re in, for the first time since 2009, and it doesn’t matter how they got there. All that matters is what they do with the opportunity. 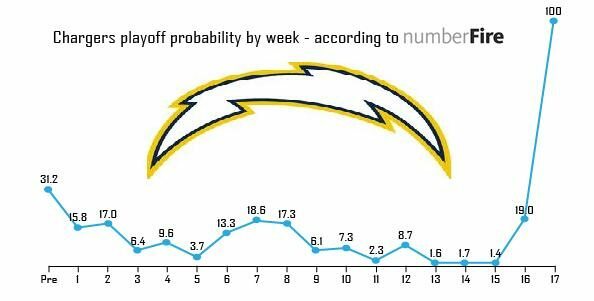 The question is which Chargers team will show up on Sunday in Cincinnati: The team that is maddeningly inept and continually shoots itself in the foot, or the team that’s seemingly capable of beating anyone in The League? Fortune swung in the home team’s favor, and now it’s up to them to prove they belong. But still, sometimes it truly is better to be lucky than good.